When one is in a resting state and begins to have elevated respiration, this is often referred to as heavy breathing. While it usually occurs after an intense workout, this condition can also happens when someone begins to breathe rapidly while sitting. As many may guess, this condition is definitely abnormal when someone is a resting state, making it a cause for medical concern as it can be caused by a variety of conditions. In general, anxiety refers to being nervous or apprehensive about an event. According to the National Institute of Mental Health, over 40 million American adults (18 years of age or older) experience some level of anxiety. For those with extreme anxiety, it could result in various symptoms, including breathing heavily, sudden fatigue, increased heart rate, increased sweating, or sudden trembling. Lastly, breathing problem could result in hyperventilation which, if not corrected, could decrease the blood’s oxygenation and lead to potential brain damage. Some people suffer from seasonal allergies, especially in the spring when plants begin to bloom, that makes it difficult for them to breathe while outside. Others may suffer from year-round allergies to pet hair, dust, or other air pollutants. Furthermore, food allergies can also cause breathing problems by preventing proper airway flow. Those with allergies will also experience wheezing, eye irritation, or other types of swelling when exposed to the allergen. Despite knowing the side effects of smoking, a vast majority of the world’s population continues to smoke cigarettes, even after it begins to cause breathing problems. Since the cigarette smoke is directly inhaled into the lungs, it damages the various filters found in the lungs and airways that are typically used to prevent bacteria from infecting the lungs. When these are damaged, the lungs are more susceptible to illnesses, many of which lead to heavy breathing. Since those who are obese have an increased body mass, it takes a lot more effort for the lungs and heart to provide the system with all its needs. Considering this, the lungs may not always be able to work at top capacity, thus making those with obesity have to gasp for air or breathe heavily even when walking at a slow or moderate pace. Fortunately, even a small amount of weight loss will vastly improve this condition. Among all reasons, sleep apnea may seem frightening since it means that some will actually stop breathing altogether while asleep. But it's not that bad because they usually begin breathing again on their own, but this may not be the case every time. The easiest way to identify sleep apnea is by the severity of one’s snore. Sleep apnea is typically caused by obesity, asthma, or smoking, among other conditions. Sometimes breathing heavily has little to do with the lungs, and more to do with the cardiovascular system. Since the blood needs proper oxygenation, it requires both the lungs and heart functioning appropriately. If the heart is not properly pumping blood while the lungs are properly pumping oxygen, the blood may become too oxygenized. The person experiencing this condition may suffer from heavy breathing even when sitting at a state of rest. As a chronic inflammatory disease of the lungs, asthma is the name given to a condition that causes the airways to swell and inflame, making it difficult for air to be carried to and from the lungs. The most common triggers for asthma include cold/flu, air allergens (pollen, dust, etc. ), cockroaches, strong fragrances, smoke, and allergies to food. Some asthmatic individuals may also notice that exercise can induce an asthma attack. While asthma can be corrected with certain medications or breathing treatments, mild asthma conditions can be prevented with proper care. 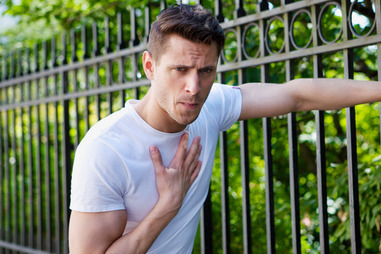 If an asthma flare-up does occur, however, those with the condition may experience sudden shortness of breath, excessive coughing or wheezing, along with chest tightness. Most have heard of emphysema before, but few fully understand what the condition means. Since emphysema is chronic, it is considered a lifelong and progressive condition which affects the lungs. Emphysema causes blockage that is damaging to the lung’s air sacs, making it difficult for the lungs to function properly by limiting the amount of oxygen being transferred from outside the body and into the blood stream, which then leads to problems of breathing. The common causes of emphysema are cigarette smoking and protein deficiency. No matter what causes your problems of breathing, you'd better see a doctor to diagnose the condition for better treatments. Almost all breathing problems are set off by some triggers – increased activity levels, smoking, weight, allergens in the air, etc. As such, the best way to avoid episodes of breathing heavily is simply to avoid the triggers whenever possible. If you have emphysema and are a smoker, start a program to quit in order to help your lungs function at top capacity. If you have severe seasonal allergies, consider wearing a face mask outdoors. Additionally, consider wearing a mask indoors while cleaning to avoid allergens such as dust, dander, or other pollutants. In addition to general avoidance of these triggers, some medications have been proven to help reduce or eliminate episodes of breathing heavily in individuals. Those with seasonal allergies should consider taking an antihistamine combined with decongestants in pill or nasal spray form. These antihistamines reduce airway inflammation to ensure the person can still breathe. For those with extremely severe allergies, they need to consider an allergy shot that allows for a larger and longer-lasting dose of antihistamines. Asthma can be treated with either oral or inhaled drugs to help either prevent or quickly reduce airway inflammation.